Helen Allingham RWS was an English watercolour painter and illustrator of the Victorian era. Helen Mary Elizabeth Paterson was born on 26 September 1848, at Swadlincote in Derbyshire, the daughter of Alexander Henry Paterson, a medical doctor, Helen Paterson was the eldest of seven children. The family moved to Altrincham in Cheshire when she was one year old, in 1862 her father and her 3-year-old sister Isabel died of diphtheria during an epidemic. The family moved to Birmingham, where some of Alexander Patersons family lived, Paterson showed a talent for art from an early age, drawing some of her inspiration from her maternal grandmother Sarah Smith Herford and aunt Laura Herford, both accomplished artists of their day. Her younger sister Caroline Paterson became a noted artist and she initially studied art for three years at the Birmingham School of Design. From 1867 she attended the National Art Training School in London, the School is presently the Royal College of Art. While studying at the National Art Training School, Paterson worked as an illustrator and she painted for childrens and adult books, as well as for periodicals, including The Graphic newspaper. One highlight was her commission to provide illustrations for the 1874 serialisation of Thomas Hardys novel Far from the Madding Crowd in Cornhill Magazine. Her illustrations from this era were signed H. Paterson and she became a lifelong friend of Kate Greenaway whom she met at evening art classes at the Slade School of Fine Art. While Vincent Van Gogh was developing as an artist by studying English illustrated journals he was struck by Pattersons work in The Graphic, on 22 August 1874 she married William Allingham, Irish poet and editor of Frasers Magazine, who was almost twice her age. After her marriage she gave up her career as an illustrator, in 1881 the family moved from Chelsea to Witley in Surrey. Helen started to paint the beautiful countryside around her and particularly the picturesque farmhouses and cottages of Surrey, to her critics, despite elements of protest in The Condemned Cottage for example, hers was an overly sentimental, conservative vision of the area. She went on to paint rural scenes in parts of the country – Middlesex, the Isle of Wight. William Herbert Allen was a notable English landscape watercolour artist whose career spanned more than 50 years from the 1880s to the 1940s. 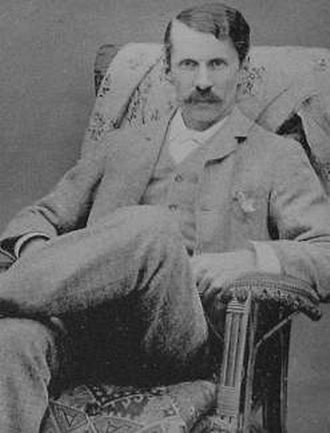 He was invariably referred to as WH rather than by his given name, born 14 September 1863 in West Brompton, London, of parents from Alton, Allen was for many years Director of the Farnham School of Art in Surrey. He produced several thousand watercolours and pencil sketches mainly of the landscapes and people of West Surrey, in addition, he produced scenes of other parts of the British Isles and various parts of Europe. These works included commissions in Italy for the Victoria and Albert Museum, Edinburgh and he was made a member of the Royal Watercolour Society in 1903 and the Royal Society of British Artists in 1904 and his work was exhibited at the Royal Academy in 1927. He moved from Surrey to Wylye, Wiltshire in 1932 and is buried at St Nicholass Church, many of W. H. Allens paintings are regularly displayed at the Allen Gallery, Church Street, Alton. These include landscapes of the local East Hampshire countryside at the beginning of the 20th century, many of his paintings were produced in the field and are bold in their depiction of light and shadows, or of changing weather conditions. His studio works are larger and of greater detail. Very few were sold on the market, but he did exhibit regularly at the major galleries. 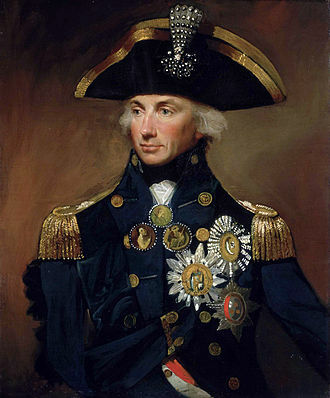 Allen embraced many styles and techniques from vivid, almost abstract, watercolours to more traditional oils and his field sketches and studies are considered to be particularly successful and were painted in all weathers and conditions. He was a private and modest man who changed peoples perception of their surroundings, in this he was helped by fellow Farnham resident and friend George Sturt, whose writings reflect Allens approach to the recording of rural life and change. Thanks to their work and rural landscapes began to be preserved at a time when progress was causing sweeping changes. W. H. Allen entered the Royal College of Art in 1884, where he came under the influence of its Director, Thomas Armstrong, a disciple of William Morris and this was to remain his predominant influence throughout his working life as an artist and teacher. Anne Margaret Coke, Viscountess Anson was an English painter, the daughter of Thomas Coke, 1st Earl of Leicester of Holkham, and wife of Thomas Anson, 1st Viscount Anson. Anne Margaret Coke was born at Holkam Hall on 25 January 1779 to Thomas Coke, 1st Earl of Leicester of Holkham, Anne had an older sister, born in 1777, and a younger sister, Elizabeth born in 1795, one year after Anne was married. Jane was married by that time and her mother was an abolitionist, spent her allowance on donations to the poor and theater tickets for her servants. Jane Dutton believed in the importance of an education for her children. At the age of 15, Anne Margaret Coke was married to 27-year-old Thomas Anson and he was a member of parliament, worth £22,000 per year, and heir to Shugborough estate in Staffordshire. According to Susanna Wade Martins, Anne was described as thin, energetic, never quiet, constantly getting into quarrels, dawson Turner described her as a woman of sweet character and a pleasing personality. George French Angas, was an English explorer and painter who emigrated to Australia. His paintings are held in a number of important Australian public art collections and he was born in Newcastle upon Tyne, the eldest son of George Fife Angas, prominent in the establishment of the new colony of South Australia. Despite showing remarkable talent in drawing, he was placed in a London business house by his father and he left on a tour of Europe and in 1842 published his first book, Rambles in Malta and Sicily. As a result of experience, he turned his back on the world of commerce. Embarking on his travels, he was soon to find his acquired skills extremely useful, Angas painted some of the earliest views of South Australia. Arriving in Adelaide in January 1844, he joined Sir George Grey on an expedition into the interior, following a trip to New Zealand he returned to South Australia in 1845 and travelled to Port Lincoln. In the following year he returned for a short while to England, in this book were views of Cape Town, Wynberg, Genadendal and Somerset West and plates depicting the local ethnic groups such as Hottentots and Zulus. Angas married Alicia Mary Moran in 1849, the marriage producing four daughters, in 1853 Angas was appointed to a position at the Australian Museum in Sydney, eventually becoming Director and staying a total of seven years. Angas was in Sydney when gold was first discovered near Bathurst, travelling there to record the gold diggings he executed a number of drawings of the scenes that he found. These were published in Sydney and subsequently in London, Angas returned to South Australia in 1860, and finally went back to England in 1863. Angas died in London on 8 October 1886, the second, dated 28 July 1849 discusses problems experienced by overseas subscribers in the delivery of Kafirs Illustrated. The third letter instructs the publisher to send a plate from his sisters copy of Kafirs to the bookbinder, Mr Proudfoot, the African antelope, was named in his honour. A Catalogue of paintings by George French Angas, illustrative of the natives and scenery of New Zealand and South Australia, sketches in Brazil, Cape Verde Islands, New South Wales, George French Angas, South Australia illustrated. Mary Ellen Bagnall-Oakeley was an English antiquarian and painter known for her work in Bristol and south-east Wales. She was a governor of the Haberdashers Monmouth School for Girls, Mary Ellen Bagnall, eldest daughter and heiress of John Bagnall and his wife Mary Ann Robbins, was born in 1833 in West Bromwich, Staffordshire. Her father John Bagnall, eldest son of John Bagnall, had become the member of John Bagnall and Sons. The firm had established by his father, who had brought five of his sons into partnership with him in 1828. The company had extensive collieries and ironworks, Mary Ellens father John died on 4 February 1840. In 1841, Mary Ellen lived in West Bromwich with her mother, younger sisters Jane and Kate, by 1851, the family had moved to Monmouth in Wales, where she resided with her widowed mother, two sisters, and staff of six. Mary Ellen Bagnall married William Oakeley, son of Thomas and Elizabeth Oakeley and their marriage was registered in Monmouth in the third quarter of 1853. Mary Ellen and her husband resided in the village of Penallt, near Monmouth, with their family and household servants, at the time of the 1861 and 1871 census enumerations. She was the mother of nine children, James Bagnall, William Ralph, Mary Beatrice, John Lewis, Jane Parnel, Elizabeth Blanche, Alexandra Ethel, Kemeys Leoline, the archer, Richard Henry. Mary Ellen Bagnall-Oakeley was a member of or associated with a number of societies in England and she took an interest in antiquarianism and numismatics, and penned numerous articles and pamphlets on antiquarian topics for societies. These included the 1902 Monnow Bridge Tower, Description of the Tower and Its History, on 8 January 1891, her husband Reverend William Oakeley was elected to membership of the Clifton Antiquarian Club that was based in Bristol. As a woman, Mary Ellen was excluded from membership in that society, she was still able to submit learned papers to the society. In addition, the historian was able to participate in the day excursions that the club sponsored, on 20 July 1889, the club undertook an excursion to Tintern Abbey and Monmouth. Sophie Gengembre Anderson was a French-born British artist who specialised in genre painting of children and women, typically in rural settings. She began her career as a lithographer and painter of portraits and her work, was the first public collection purchase of a woman artist. Her painting No Walk Today was purchased for more than £1 million, Sophie was born in Paris, the daughter of Charles Antoine Colomb Gengembre, a French architect and artist, and his English wife, whose maiden name was Hubert. They lived in Paris during the years of Sophies life, where her father was acquainted with artists, intellectuals. Circumstances required that the family leave Paris and live in an area in France from 1829 to 1843. At seventeen she developed an interest in art when a portrait painter visited her town. She had two brothers and Henry P. Gengembre and her brother Philip changed his name to Philip Hubert, using his mothers maiden name, and was a successful architect in New York City. She was largely self-taught in art, but briefly studied portraiture with Charles de Steuben in about 1843, soon after she began her studies, he left for Russia and did not return within the one year allotted for her studies. She did develop relationships with women artists at the school where she gained a little more instruction. The family left France for the United States to escape the 1848 revolution, first settling in Cincinnati and her brother Henry P. Gengembre was an artist, active in Cincinnati in the early 1850s. Her portrait and Brittany landscape paintings were exhibited in October 1849 at the Western Art Union Gallery, four or more of her illustrations were included in the Historical Collections of the Great West by Henry Howe. She collaborated with Walter Anderson, her husband, on portraits of Protestant Episcopal bishops. She lived in Manchester, Pennsylvania with her parents, where she is believed to have married Walter Anderson and she worked there for the chromolithographers Louis Prang & Company. In 1854 the Andersons moved to London, where Sophie exhibited a still life of fruit, game and it was considered an admirable composition made with surprising truth. Her works were exhibited at the Royal Academy. Clare Tony Atwood was a British painter of portraits, still life, landscapes and decorative flower subjects. Atwood lived in a ménage à trois with the dramatist Christabel Marshall, Atwood was born in 1866 at Richmond, the only daughter of Frederick Atwood, an architect, and his wife, Clara Becker. Named Clara at birth, she used the form Clare and was known as Tony. Atwood studied at Westminster School of Art and the Slade School of Fine Art, Atwood first exhibited at the New English Art Club in 1893, becoming a member in 1912. She held an exhibition of her work at the Carfax Gallery in 1911, in 1917, during World War I, she was commissioned to paint war scenes for the Canadian Government through the Canadian War Memorials Fund. The Fund arranged for Atwood to visit the camp at Folkestone in Kent to gather ideas for the work. 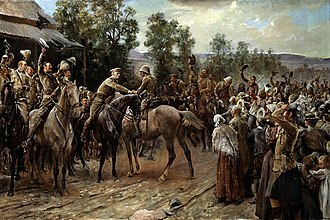 However, Atwood decided instead to paint a scene at one of Londons main railway stations where troops were waiting for trains to take them to camps or to the front. During the war, Attwood was commissioned by the Womens Work Sub-committee of the Imperial War Museum to produce several pieces depicting the activities of the Womens Voluntary Service. The most notable of these, Christmas Day at the London Bridge YMCA Canteen, records the visit of the actress Ellen Terry, in 1920 she was commissioned for four more war paintings by the Imperial War Museum. She, Edith Craig and Christabel Marshall were friends with many artists, Atwood designed props for several of Edith Craigs productions with the Pioneer Players, including the 16 foot high crucifix for their production of Paul Claudels The Hostage. Atwood was a member of the Pioneer Players, Atwood occasionally performed at the Barn Theatre at Smallhythe Place in Kent, which was founded by Craig to stage performances in memory of her late mother, the actress Ellen Terry. Atwood acted in the matinée at the Palace Theatre, London on 23 April 1929, in July 1932, Atwood decorated the shoe for Craigs production of The Shoe in Tenterden. After Craigs death, Atwood wrote an essay about Craig, Atwood suffered a fractured femur, senile myocarditis and heart failure, and died at Kench Hill Nursing Home, Kent, on 2 August 1962. A portrait of a fairy (1869). The title of the painting is Take the Fair Face of Woman, and Gently Suspending, With Butterflies, Flowers, and Jewels Attending, Thus Your Fairy is Made of Most Beautiful Things – purportedly from a poem by Charles Ede. Retreat of the French Grand Army from Moscow, intercepted by Russian Cossack, 1812, published January 1813. Sky Pilot by Lawrence Atkinson for the cover of Wheels, 1918. 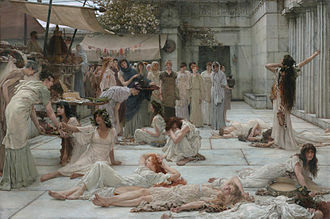 Olympia in War Time by Clare Atwood from the IWM collection.